"The Town That Time Forgot"
"Wee Bit of New England in Wisconsin"
The ladies of the missionary society met and finished the quilt they had been making for their pastor. The annual meeting of the prohibition club would meet the following Thursday for the election of officers and "other important business". Miss Kate Miller was at home "quite ill" after graduating the week before from the Evansville Seminary and completing two years of study in just one year. Public school closing exercises were held in the church the previous Friday evening. Lloyd Porter "won much praise" for the way he delivered "his declamation". Three students received their diplomas: John Van Vleck, Eddie Savage, and Paul Savage, all of whom, along with their teacher, Miss Jones, received "some beautiful presents". E.P. Savage raised his barn the previous Friday; the "young folks" were hoping to hold a dance in it. Charles Miller bought one of Eugene Van Vleck's "trotters" for $70. ★ The Janesville Gazette reported on June 29, 1892, of the strange death of Jerry McCarthy, a Cooksville resident. McCarthy succumbed to a nose bleed that lasted for hours. The nose bleed was blamed on "overwork". The week before the illness of a Cooksville "young lady" was blamed on "too much study". ★ In January 1894 elderly Cooksville resident Joseph Mayo was found by passers some distance from his home lying beside his "cutter" and "stricken by paralysis". The Good Samaritans, not knowing what ailed him, "laid him across the cutter, tying up the lines and started the horse home". He was found by others who were able to render the proper assistance. Because of Mayo's "advanced age", his chances of recovery were "doubtful". ★ Cooksville farmers were reported as having "a lively time" in January 1895, in which "a runaway, a beer keg, muscle and cold weather figured". ★ During a storm on Saturday, September 12, 1896, the Cooksville Norwegian church was struck by a bolt of lightning and burned to the ground. A fire alarm called the community to the fire, but it was impossible to do anything as the whole building was engulfed in flames in a matter of moments. All that was saved was a part of the communion service. The building was insured for $2,000 and would be rebuilt. The church ladies had spent the Wednesday before giving the building a "thorough cleaning". ★ A "band of gypsies" passed through Cooksville in June 1901, their "principal business" seemed to be "trading horses". 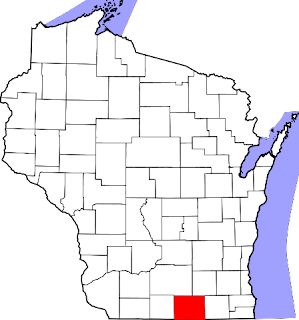 Cooksville is located in Rock County. was erected in Cooksville in 1996.